The Matrix – ten years old?! In the past couple of months, I’ve nearly abandoned my feedreader in favour of what I consider to be the “smart crowdsourced filtering” I’ve gained from the people I’m following on Twitter – I rarely miss a news item and often still see the most insightful posts through tweeted links. However, I have been missing what my friend have been writing about, and a bunch of other stories or items that just haven’t floated across my Twitter feed. So, in the last week, I went back to my feedreader, which is currently Google Reader with the web client on the Mac, FeedDemon 3 beta sync on Windows, and Byline on the iPhone. 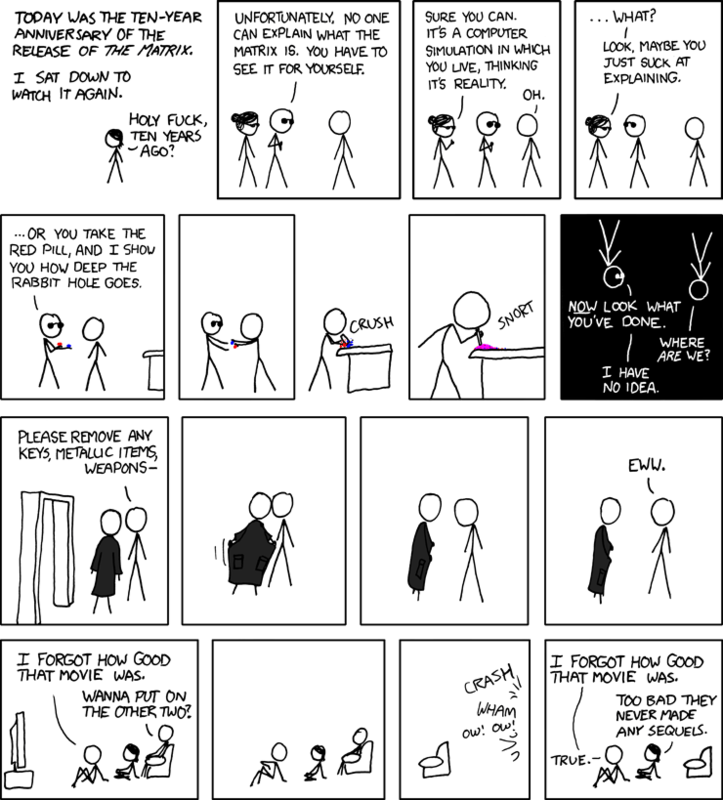 In doing so I came across an xkcd comic that I’d missed, and the news that The Matrix is now ten years old. Click through for a full-size cartoon on the original site. It’s hard to believe that ten years have passed. The Matrix was a totally revolutionary film and it blew me away. The influence of the movie on the current industry is clear – just as an example, the visual style (including “bullet time”) has been much copied across all kinds of formats in the past decade. The cross-media reach of the storyline, whereby you “had” to have played the video game Enter the Matrix and watched the animated Animatrix shorts to get a “full” picture of the narrative, has inspired other filmmakers looking to invent franchises. If you’re looking for a better understanding of how this all worked, I recommend the book Convergence Culture which uses The Matrix as one of its case studies – when I read it last month it explained several parts of the story I’d never understood, reawakened my interest in the Matrix universe and inspired me to pick up the trilogy on Bluray. I have to say I agree with the xkcd cartoon – the first was, for me, the best of the trilogy, perhaps because of the freshness and mystery, perhaps because of the lack of overcomplicated backstory and exposition that the second and third attempted to insert.